I am just a bit over Kale. We are bombarded through the media with a constant dialogue on the benefits of, and recipes for this vegetable, but frankly I do not like it. Give me a plate of steamed Broccoli any day. I have been growing Kale for the past 5 or 6 years, being caught up in the “you must grow and eat this fabulous vegetable” hype that has occurred over the last ten years. I have eaten it in countless ways- salads, chips, stir-fries, sautéed and juiced- both at home and in restaurants and still come to the same conclusion – I don’t really like it – I can eat it but is it worth eating something you don’t really enjoy. To me the answer is NO. If you take any notice of modern media, it is almost implied that you are being remiss in your culinary responsibilities if you do not serve it up to your family as it is reputed to be the most nutritious of the cabbage (Brassicaceae) family. And to be truthful, according to any nutritional analysis I can find, weight for weight, this is correct. I would be the first to agree that the Brassicaceae family have nutritional benefits not found in many vegetables so agree we should be eating more of these plants. However, having weighed 100 grams of Kale and 100 grams of Broccoli (see picture below) you need a lot less Broccoli then Kale to get the same amount of nutrition. I can easily eat 200grams of Broccoli every day, effectively getting the same or more nutritional benefits of 100grams of Kale, but would struggle to eat 100grams of Kale every day. Thus, if I am looking at trying to maintain effective levels of consumption of the Brassicaceae’s then Broccoli is the vegetable for me. I also prefer growing Broccoli in the garden. 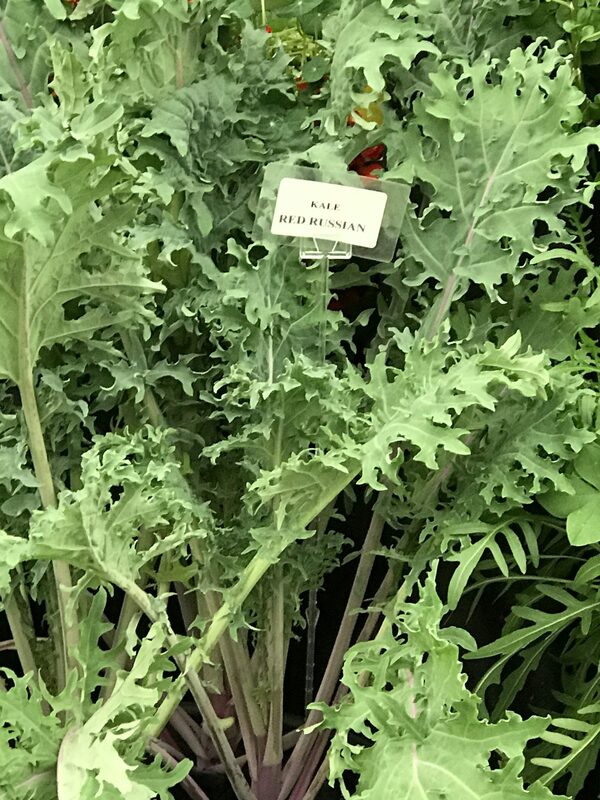 Kale takes up a lot of room in the garden, growing into tall rangy plants, often needing staking and over shadowing other plants. They go to flower quickly then self-seed everywhere. Whereas Broccoli is a much more compact and shorter plant and if managed correctly does not seem to go to flower as quickly. The real lesson here is to grow what you enjoy eating regardless of what is trendy. So finally, I am going against trend and not planting kale this year. I will continue to grow rocket, broccoli, cabbage, cauliflower and brussels sprouts, which I love to eat and usually consume at least one serve, if not several, of these vegetables every day ensuring I continue to get the wonderful nutritional benefits of the Brassicaceae family. I agree with you, Kathy, I don’t really like kale either, but I continue to grow it because my chooks love it. And if I don’t bother about protecting it from the Cabbage Whites, they get the added bonus of plenty of green grubs. 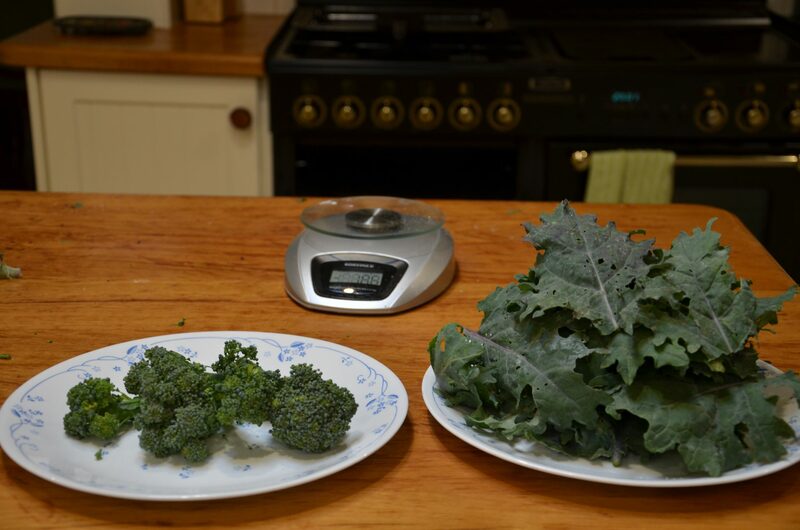 Interesting to see the comparison in volume between the same weight of broccoli and kale. If I do anything with it in a culinary sense, it is to dry it, crush it into flakes and use them in my bread or in casseroles. That way I get the mineral nutrients and probably some of the vitamins without the taste or having to consume huge volumes. Love that you are keeping your girls(chooks) nice and healthy-great use for Kale!